Bombyx mori is an important domesticated economic animal and an important model organism. Its DNA methylation function and biological significance have important reference implications for the study of species with low methylation rate. Our study shows that MethylC-Seq has high false positive for the detection of cytosine (mCs) in species with low methylation. 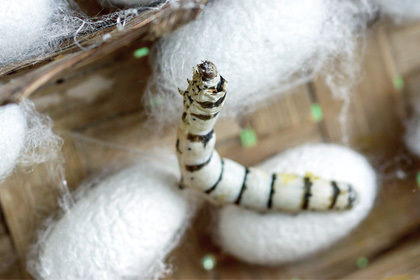 Therefore, we used Illumina high-throughput bisulfite sequencing to construct the first single-base resolution insect genomic methylation map, the silk gland methylation map of silkworm. It can be applied to the epigenetic analysis of insects that have hypomethylation levels and study the functional significance of DNA methylation. Relevant research results have been published in the internationally renowned academic journal Nature. The completion of the methylation map of Bombyx mori provides an important reference for us to better understand the epigenetic regulation mechanism of insects, and also lays a solid foundation for further exploration of potential epigenetic contributions during the artificial selection of silkworm and promotes the development of animal and plant breeding science both in depth and breadth. Hui Xiang, Jingde Zhu, Quan Chen, et al.Single base-resolution methylome of the silkworm reveals a sparse epigenomic map.Nat Biotechnol. 2010, 28, 516-520.